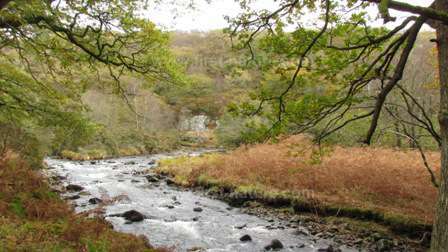 This nature reserve lies in the centre of the Rhinogydd mountains and so you should be prepared for an energetic walk from any of the entry points in order to enjoy the fabulous scenery in the area. Much of the reserve consists of a broad expanse of upland heath and is of particular importance for birdlife. This reserve is managed by Natural Resources Wales (NRW). Apart from being a SSSI and SAC, Rhinog NNR is also a Biogenetic Reserve. Biogenetic Reserves are a non-statutory designation made by the Council of Europe. The concept arose from the Bern Convention on the Conservation of European Wildlife and Natural Habitats (ratified by the UK Government in 1983). The Rhinog Biogenetic Reserve (the only one in Wales) is part of a network of special habitats across Europe which are designated because of their importance in efforts to preserve the genetic variety of European wildlife species. In addition to their additional legal status, Biogenetic Reserves have two principal purposes. One of these is the conservation of species and habitats in such a way that their biological balance is retained; the other is to provide natural ecosystems so that research can be carried out into how species interact with one another in these special areas. This entry point, from the village of Llanbedr, involves a drive down a long and very narrow, rocky-sided lane with some passing places along the way. The village of Llanbedr lies on the A496 between Barmouth in the south and Harlech to the north. If driving north from Barmouth look out for the Victoria Inn in Llanbedr on the right hand side of the road, and then turn right immediately after you pass the pub - this road is signed to Cwm Bychan. Follow this lane for approximately 8 kilometres. Do not turn right towards Cwm Nantcol, but keep following the signs to Cwm Bychan. You will eventually come to a lake on the right hand side of the road at the far end of which is a privately owned car park which has room for around 30 vehicles.Parking is charged both by vehicle and by passenger - a car containing four passengers costs (in 2011) £6 - £2 for the car and a further £1 per passenger. This entry point from the village of Llanbedr involves a drive down a long and very narrow, rocky lane with some passing places along the way. The village of Llanbedr lies on the A496 between Barmouth in the south and Harlech to the north. If driving north from Barmouth look out for the Victoria Inn in Llanbedr on the right hand side of the road, and then turn right immediately after you pass the pub - this road is signed to Cwm Bychan. Follow this lane until you come to a small stone bridge which crosses the river Artro and then turn right towards Cwm Nantcol. Continue along this very narrow lane for approximately 6km (4 miles) until you come to a small privately owned car parking area for around 6 cars on the side of the of the road. Some parking spaces are on steep and muddy ground, and there is a charge for parking there. The minor road to this entry point for Rhinog NNR lies off the main A470 between Trawsfynydd and Dolgellau. If travelling south towards Dolgellau look out for a minor road (it is for the most part little more than a track) on the right hand side of the road once you have passed through the village of Bronaber. You will travel for approximately 3 km (2 miles) along this minor road across Crawcwellt Moor until you come to the Forestry Commission car park, which is just inside a forest gate. While inside the forest, whether on foot or in a vehicle, take great care and keep a look out in case there is work being carried out in the plantation. You are requested to park well out of the way of large machinery and other forestry vehicles as they may need access along the woodland tracks at any time. There are no facilities at the reserve, but there are portaloos in the car park at Cwm Bychan. There are shops, pubs and cafés in the village of Llanbedr. 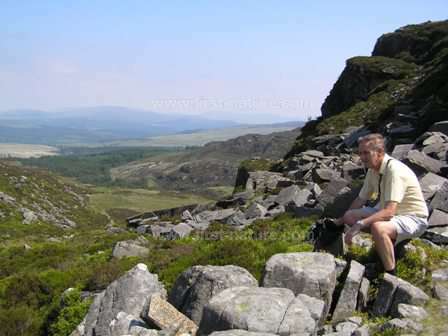 This is a reserve consisting of upland heath in mountains, and inevitably, therefore, the paths are rocky and steep, and they can be muddy and slippery in wet weather. Good walking shoes are essential, and you should be sure to have adequate warm and waterproof clothing with you in winter. In summer, when we last visited, it was very hot and we were glad of the bottled water that we had with us! The upland heaths of Wales are wonderful places to see birds, and Rhinog NNR is no exception. One of the special birds that nests in the reserve is the Ring Ouzel (Turdus torquatus). These birds arrive in March from their overwintering quarters in north-west Africa, and they build their nests in stunted trees or sometimes on rocky ledges. Ring Ouzels remain with us until the end of summer. Another summer visitor to Rhinog is the Northern Wheatear (Oenanthe oenanthe), which nests in the open grasslands in holes. 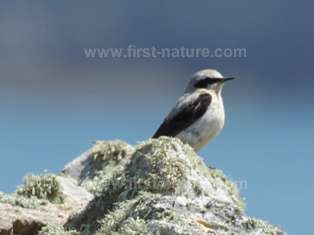 Wheatears are most visible when they perch on rocky outcrops, which seems to be their favourite pastime! As for resident birds in the NNR, Merlins, which need vast heather moors, are by far the rarest members of the falcon family that you may be lucky enough to spot on a visit to Rhinog. Merlins share the territory with Peregrine Falcons, Hen Harriers and Kestrels which prey on the smaller birds that also make their homes in these wild places. Other increasingly rare and threatened birds that are sometimes seen at Rhinog include small populations of Black Grouse (Tetrao tetrix) and Red Grouse (Lagopus lagopus). In late summer the upland heaths are transformed by the heather, which bursts into flower colouring the landscape a lovely mauvey-pink, but there are many other flowers to enjoy earlier in the season including Heath Spotted-orchids (Dactylorhiza maculata) which are particularly prolific in the area around the lake beside the Cwm Bychan car park. 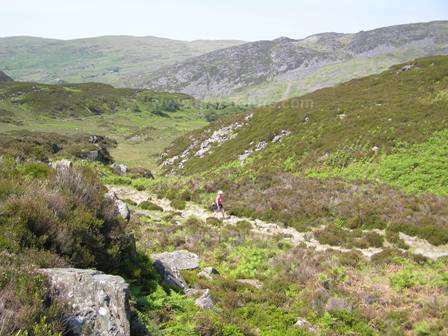 Roman Steps, an old drovers route, is one of the traditional paths up into Rhinog NNR. 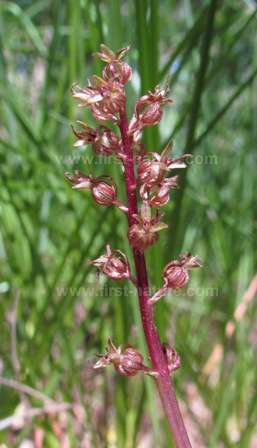 It is also one of the few places in Wales where the Lesser Twayblade (Neottia cordata) has been recorded. We have never found it there despite searching very hard for it. This tiny orchid only grows to a height of around 10cm, making it extremely hard to spot in its preferred habitats. It is found under heather and bilberry bushes (both of which are common on the Rhinog mountains), in bogs (in association with sphagnum mosses) and also in mossy ground under pine trees. Lesser Twayblade has strange colourings: the two heart-shaped leaves that grow about a third of the way up the stem are bright green - the colour of Granny Smith's apples - but the stem and tiny star-like flowers are a reddish-bronze colour and are almost iridescent when seen in the sunshine.